I received the shared products for an honest review. Special Thank you to SweetsGiftBox for sponsoring this post. As always all thoughts and opinions are 100% my own. Valentine’s Day is around the corner! Unless your mother, neighbor or teenage babysitter decides they don’t have plans… you are IN for Valentine’s Day. Its okay, I know it’s not always easy to get out so I’ve pulled together how you can have a Valentine’s Day in! Step 1. Order your sweets! 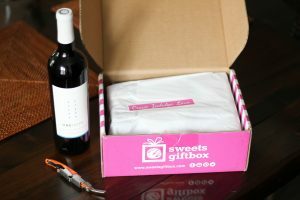 SweetsGiftBox is a company where you can order a box of goodies to your house. They also rock because they don’t have you stuck in any contract. You can chose to purchase one time or monthly and if you chose monthly you can pause at anytime. Best of all with every purchase you help feed a hungry child. Don’t forget about your furry friend! You can order some goodies for you pet, if you have one from their sister company PetGiftBox. It’s seriously so easy with no ties to order again, but I promise you… you will. Order here and use code BUSYLITTLEIZZY for 50% off a subscription to SweetsGiftBox and PetGiftBox or 40% off a one time purchase. Yes you read that correctly, you need to order the wine! Why would you even go to the grocery store, liquor store or specialty wine shop? Just order it all online! 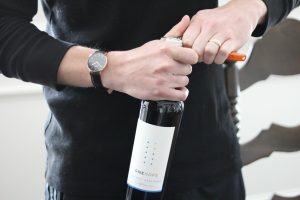 ONEHOPE sells wine and gift boxes so you will pretty much find something to meet everyone’s needs. They even have non-alcohol gifts. So like I said, it’s okay if you are going to be in on Valentine’s Day because you can get all your goodies delivered to your door… and celebrate once the kid(s) is/are in bed. Enjoy your special night in! Lots of great ideas! 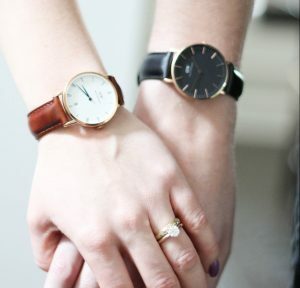 Love those watches! Thank you Stephanie! They are gorgeous aren’t they? A box with wine delivered to my house? Sign me up! Great post! Ahh perfect ideas for Valentines day!! We always stay in Valentines night.. its too crazy out there so all of this is perfect for that. Our anniversary is Feb 15 so we go out the night after, if we can. I think we will be in this year. They are really gorgeous watches aren’t they? these are all such great ideas! I love having date nights in and when things can be delivered to my door … even better! I am so glad you shared this. This is a PERFECT date night in. What a great round up! 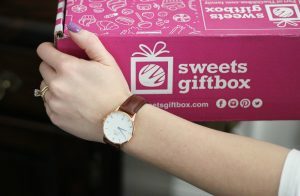 Love the sweets gift box! We will definitely be staying in so this is a great idea for us! Thank you Kristen, we love having dates in & I love ordering things online. That’s such a cute idea! We’ll most likely stay in so now I have to grab a box of goodies! Yum! The sweets and wine are speaking to me! 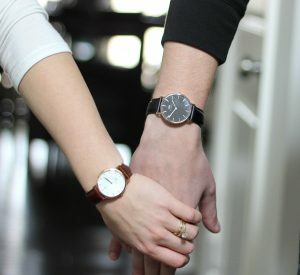 Love the watches For you two, perfect night in together. Sometimes staying in is even better. No need to get all dressed up. Just wear some comfy clothes and food take out is just as good. And with wine, that just tops it off! Perfect date night! Oh how I love this!! So sweeet! 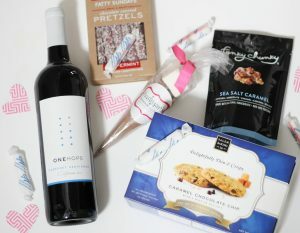 I just love subscription boxes and a date night in is one of my favorite things to do! Great watches too! This sounds like the perfect night in!